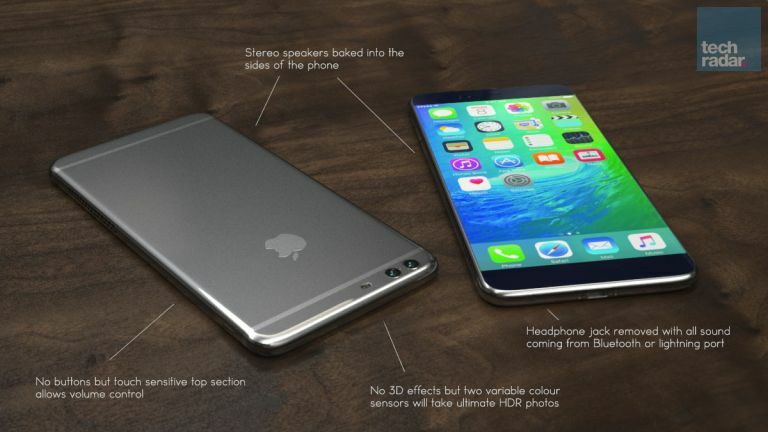 The phone experts over at TechRadar have been hard at work whipping up a render of what they want to see from Apple's future iPhone 7, giving us a glimpse of what it could end up looking like - an it's set to be an amazing device. We're sure that Apple has got plans in place for the iPhone 7, but if the Cupertino company takes any cues from TechRadar's prediction, we could be in for a very special smartphone. Highlights of TechRadar's dream iPhone 7 include two cameras on the back for an incredible HDR mode and hyper-clear sharpness, as well as a buttonless design that ditches the Home button in favour of a bigger screen and full 1080p high definition resolution. There's no headphone jack either – instead you would be able to use the Lightning port or Bluetooth to listen to tunes. One particular stroke of genius is to have stereo speakers built into the sides of the iPhone 7 to allow you to hold the handset in landscape mode to watch movies, ensuring the sound doesn't get muffled by an errant palm or finger. TechRadar has produced the wish list for the iPhone 7, along with a render of what its panel of experts want the smartphone to look like, as part of its Phone Week, an event celebrating the best of smartphones that's been leading up to the TechRadar Phone 2015 awards, which kick off tonight at 8PM BST. Make sure you follow TechRadar on Twitter to get the winners, losers and all the gossip from tonight's TechRadar Phone Awards.